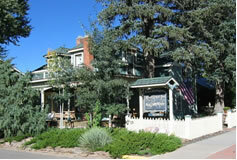 The Historic Main House showcases the Italiante Victorian architecture reminiscent of the turn of the 1900s’. It has been totally renovated and restored. Renovation includes new plumbing, new electrical, and zoned in-floor heating system throughout most of the compound and hot water baseboard heat in selected areas. The property sits on the corner of three city lots and displays mature landscaping (much of it xeroscaped) with hundreds of perennial flowers and a water feature. The Main House is also furnished with many antiques and accessories. Please click here for additional pictures of property.